Golden Girl Holly Defends Title and Wins Two More Gold Medals! 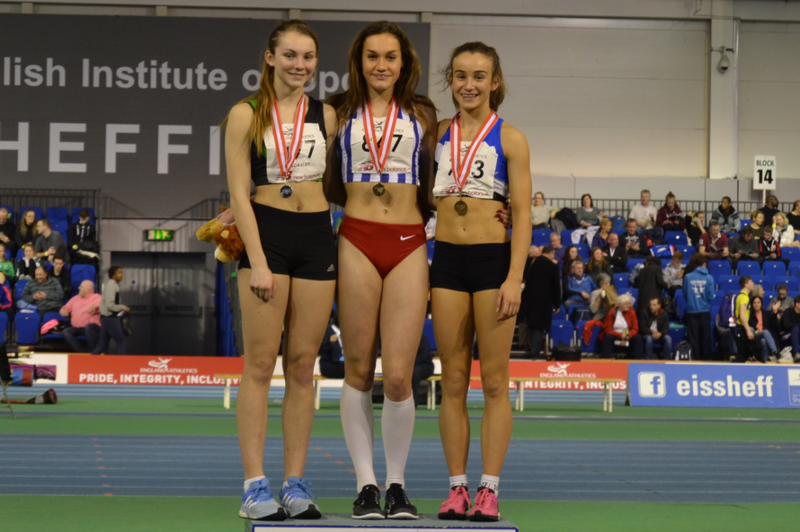 Year 11 student Holly Mills was in top form at last weekend’s England Athletics National Indoor Championships held at the English Institute of Sport in Sheffield, with two gold medal performances in the U17 Long Jump and 60m Hurdle events. Going into the Long Jump competition on the Saturday Holly was a clear favourite based on her performances from last year, and her current indoor form from this year where her season’s best jumps were a considerable way further than any of the other competitors. 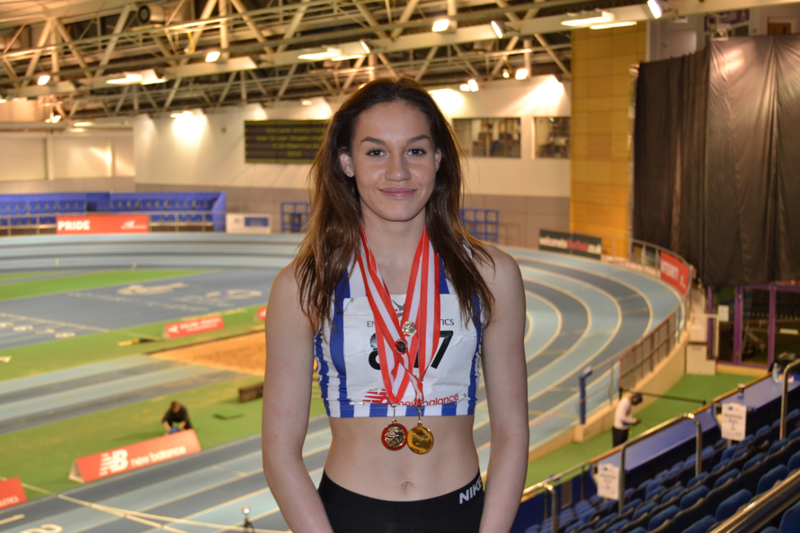 Having won both the indoor and outdoor National U17 Titles last year she was therefore looking to defend her title, plus enhance her growing reputation as one of the UK’s best Long Jump athletes, not only in her U17 age group but amongst all women Long Jump athletes. Holly set out her intentions from round one with an impressive leap and new indoor personal best of 6.13m. However, while that was strong enough for gold it ended up being only her third longest leap of the day as she extended her lead with a fifth round jump of 6.22m – the second longest ever indoor by a British Under 17, second only to Margaret Cheetham’s 6.25m in 1985. In the sixth and final round she added a 6.16m leap to end an impressive series of jumps. These 6m plus jumps also achieved the required qualifying standard for Holly’s season goal of a place in the Team GB squad at the European Youth Championships in July and she will now look to build on these indoor performances in the early part of her summer schedule. Day two saw Holly in action in the 60m Hurdles and again she was one of the favourites having set the fastest times in the indoor season so far this year. She cruised through the heats in a steady time of 8.86secs, but showed what she is capable of in winning her semi final in the fastest time of the day in 8.66secs. With a couple of rivals improving their own best times Holly knew that the final could well be decided in the first few strides. This proved to be the case as she was quickly out of the blocks putting pressure on her rivals. With a couple of rivals faltering at the first hurdle she led over all hurdles and despite heavily fatigued legs, crossed the line to win in 8.67secs and claim her first National Indoor Track medal and her second Championship Title of the weekend.